Not a cheap imitation! This jeweler's quality Diamond Reamer Set includes a beautifully machined aluminum handle with non-slip knurled grips, precision collet and pocket clip. Compartment inside handle stores reamers conveniently and safely. Our diamond reamers will enlarge and deburr tiny holes in beads, metal castings, molded plastic, wood, glass and more. Reamers cut in any direction. 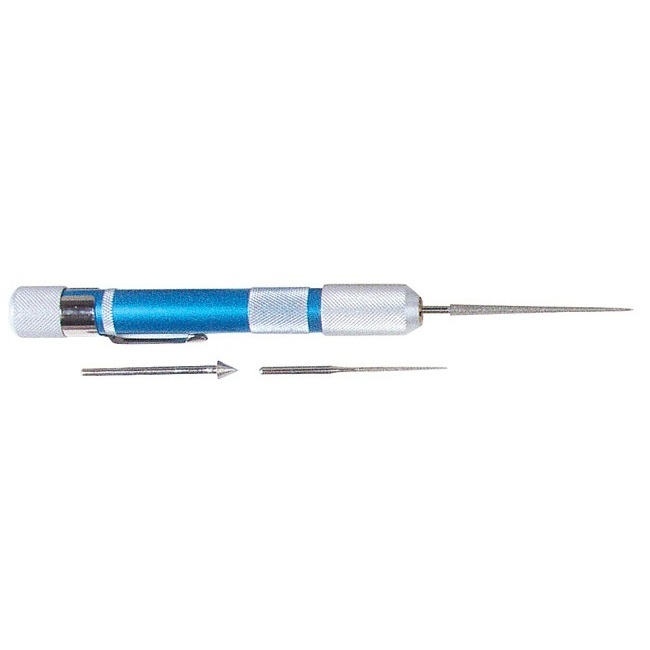 Set includes 3 reamers: 2 inches long x 1/8 inch dia. tapering to a point; 1 inch long x 1/16 inch dia. tapering to 1/32 inch; 5/16 inch long x 3/16 inch dia. with cone-shaped tip. 3 mm shank diameter.